Written as a response to the Ed Tech Blog Carnival 2012. Copyright, piracy, fair use, and freedom of Internet has gotten a lot of attention recently, especially with the coverage of the United States Congress reviewing and possibly voting on the SOPA & PIPA bills. It was a great opportunity to have a conversation with students about the issues. Early in the year, I had reflected about students in an 1:1 environment and their constant access to media. With the technology literally in their hands all day, there is responsibility for them to know how to respect the creators wishes when re-using their work. In our district, students are introduced to copyright and digital citizenship concepts in elementary school, to what extent is influenced by their teacher. Once in the middle school, students are given a more in depth instruction and application of Creative Commons in 6th grade computer class and research projects through the library. By 8th grade, the students know how to find appropriate sources. They use EasyBib to create bibliographies for their work. Some students even begin to find their voice, and they champion the cause by following up with teachers about their media choices. Occasionally questioning if the media selection is eligible under Fair Use is just a task avoidance tactic, but more often it is genuine. This year I have a new stance on images. When my 8th graders need to use images for a class assignment or project, I no longer put it in writing that the image needs to be Creative Commons or appropriate for use. I also do not tell the students specifically how to cite the work. I am not against having the students do the right thing nor am I against observing copyright. In fact, it is quite the opposite. I want students to make the right decision even when there not a teacher looking over their shoulder. The teacher vs. devil on the shoulder scenario is not preparing them for life outside of school. I lead by example. Things that I create just for classroom use, still use Creative Commons images even if I feel like I would be covered under Fair Use for other media selections. The most common requirement for Creative Commons is Attribution, we can use the work of someone else as long as we give them credit. It does not state that this needs to be an official bibliography. For blogs and other online publications, normally the image is credited to a person and the image itself links to the original source. The students see examples, especially on the Spanish Techbook of images credited and linked to the original. Can I tell whose original work it is? Can I get to the original if I want to see it? This is well stated on the Guidelines/Best practices for citing Creative Commons work. Recently it has become easy to find creative commons work. Images and other works are no longer hidden among a sea of copyrighted work. Using Creative Commons officially became the cool thing to do when Google allowed users to search based on license. The overall search that I recommend for students is Search.CreativeCommons.org, combines Creative Commons search results from multiple sites and displays it in one location. This is not just images, but music as well. I recently read another blog post that had four creative commons photos sites you should know about. 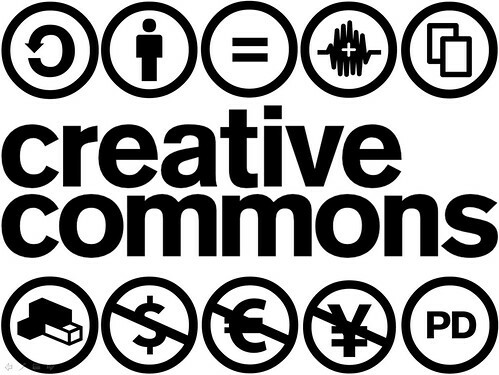 I want students to understand that creative commons is win-win for everyone. People who create the work get credit, but because they give permission for people to use the work, it also means more people are likely to see their work. When searching for images or music to incorporate, creative commons gives you so many options, without having to spend a lot of time tracking down creators to personally get permission. Creative commons is common sense media distribution and dispersion. This entry was posted in Reflection, Technology and tagged creative commons, culture, footprint, images. Bookmark the permalink.